Porsche 911 Carrera is a perfect combination of dynamic looks, performance and comfort. It happens to be one of the finest sports coupes in the world. Porsche 911 Carrera comes in 17 sizzling colors – Black, Guards Red, Carrara White, Speed Yellow, Atlas Grey Metallic, Arctic Silver Metallic, Meteor Grey Metallic, Midnight Blue Metallic, Cobalt Blue Metallic, Forest Green Metallic, Slate Grey Metallic, Dark Olive Metallic, GT Silver Metallic, Lapis Blue Metallic, Lagoon Green Metallic, Metallic Pine Green and Carmon Red Metallic. The exterior consist of Adjustable Bi-Xenon Headlights, Fog Lights, Power Adjustable Exterior Rear View Mirror, Rear Window Defogger and attractive tail light clusters. The broad alloy wheels give a sturdy look to the car. 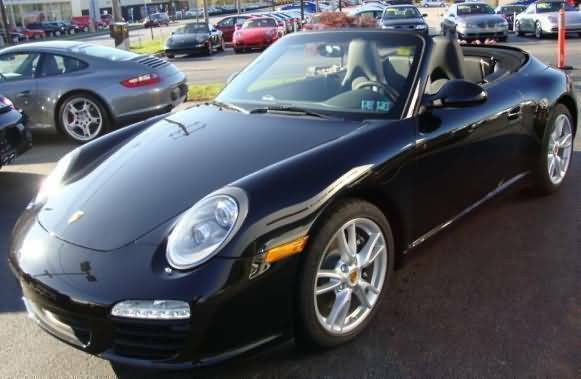 Porsche 911 Carrera has given special attention to the comfort of the occupants. The car consists of Multifunction Power Steering, Power Windows, A.C with Automatic Climate Control and Air Quality Control, Remote Trunk Opener, Remote Fuel Lid Opener, Low Fuel Warning Light, Accessory Power Outlet, Trunk Light and Vanity Mirror. Other Comfort Features include Rear Reading Lamp, Rear Seat Headrest, Rear Seat Centre Arm Rest, Height Adjustable Front Seat Belts, Cup Holders and Rear A.C Vents. The car also has Heater, Adjustable Steering Column, Tachometer, Electronic Multi-Tripmeter, Leather Seats, Glove Compartment, Digital Clock, Outside Temperature Display, Cigarette Lighter, Digital Odometer and a Hi-tech Audio System. Assist, Central Locking, Power Door Locks, Child Safety Locks, Anti Theft Alarm, Driver Airbag, Passenger Airbag, Side Airbag-Front, Side Airbag-Rear, Seat Belts, Seat Belt Warning and Door Ajar Warning. Other safety features include Side Impact Beams, Front Impact Beams, Adjustable Seats, Keyless Entry, Vehicle Stability Control System, Engine Immobilizer and Engine check Warning. Porsche 911 Carrera consists of 3.6L, 325 bhp, 6 cylinder Boxer, petrol engine which produces a maximum power of 329.5 PS at 6800 rpm and a maximum torque of 37.7 kgm at 4250 rpm. It is linked to 6 speed Gear box with Manual Transmission. The price of Porsche 911 Carrera is Rs.79,69,500 (taking Mumbai as base price location). However, the price specified is approximate price which excludes tax, registration, insurance and cost of accessories.